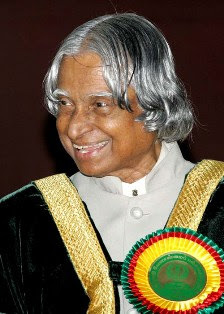 Avul Pakir Jainulabdeen Abdul Kalam born October 15, 1931, Tamil Nadu, India, usually referred as Dr. A. P. J. Abdul Kalam, was the eleventh President of India, serving from 2002 to 2007. A notable engineer, he is often referred to as the “Missile Man of India” for his work and is considered a progressive mentor, innovator and visionary in India. He is also popularly known as the People's President. His term as president ended on July 25, 2007. Kalam is an alumnus of King's College London. He has received honorary doctorates from as many as thirty universities. The Government of India has honored him with the nation's highest civilian honors: the Padma Bhushan in 1981; Padma Vibhushan in 1990; and the Bharat Ratna in 1997. Dr. Abdul Kalam graduated from Madras Institute of Technology majoring in Aeronautical Engineering. He, as the Project Director, made significant contributions to the development of India's first indigenous Satellite Launch Vehicle (SLV-III). He, as Chief Executive of Integrated Guided Missile Development Programme (IGMDP), also played major part in developing many missiles of India including Agni and Prithvi. He was the Chief Scientific Adviser to Defence Minister and Secretary, Department of Defence Research & Development from July 1992 to December 1999. Pokhran-II nuclear tests were conducted during this period, led by him.